In the early hours of Tuesday (December 8) 12171 – Lokmanya Tilak Express that was travelling to Haridwar met with an accident near Palwal in Haryana. The express collided with an EMU shuttle train that had halted at the same track. The accident happened at 8:25 AM between Palwal and Asaoti railway stations near the village of Baghola, to be exact. In the accident one person was reported dead and 100 others are injured. The deceased person was identified as the driver of EMU train, while the guard of Lokmanya Tilak Express was among the people admitted with serious injuries at hospitals in Palwal and Faridabad. Rescue operations are already underway and injured passengers are being readily pulled out of the smashed carriages and sent to nearby hospitals. Team of doctors is already on the spot for preliminary inspections. Chief Public Relation Officer (CPRO) of Northern Railways, Neeraj Sharma blamed fog and negligence on the part of the driver as the causes of the accident. 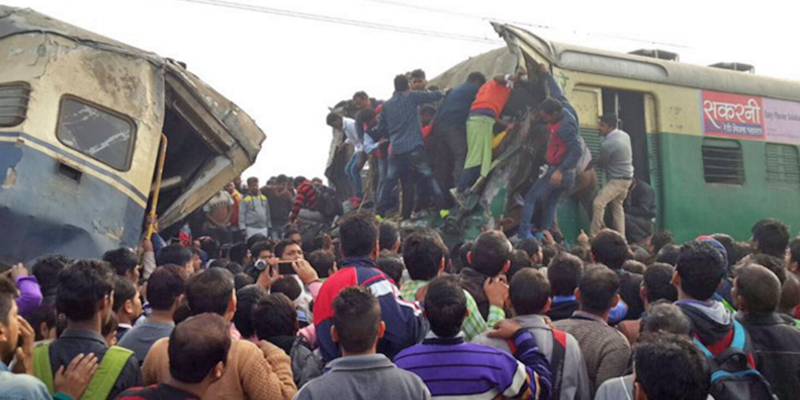 In the wake of the accident train services to Mathura, Okhla, Kosi, Nizamuddin and New Delhi have been disrupted. We will keep you updated about the disruptions and cancellations as it happens.